Yup, it’s true. 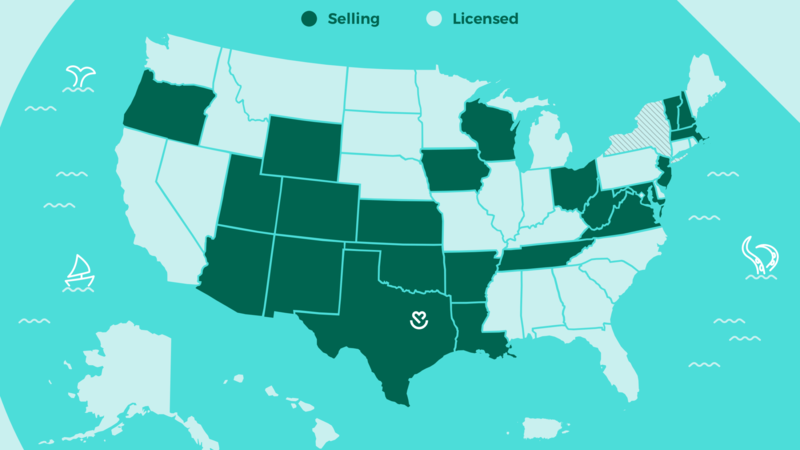 Bestow is now live in 22 states. It seems like it was just yesterday we shared the great news about our Series A funding and the launch of our first two states: Texas and Utah. But now just two months later, we are thrilled to announce that we have now extended coverage in 22 states. And more are on the way! If your state is not on our list right now, sign up on our waitlist to be notified when we’re in your area. You can also check out our launch map to get the most up-to-date deets on where we’ve open for business. You may have heard that we’re a little mission-minded (Ok, we’re very much mission-minded). We believe that life insurance affordable, convenient, smart, and every bit as straightforward as buying any other gift for your family. That’s why we’ve redesigned the buying experience from the ground up, leveraging data and technology to cut down the time to buy coverage from weeks to a matter a minutes. Really! Our own life insurance survey found that millions of Americans want life insurance coverage, but don’t have it because they assume it’s time consuming and expensive. And that’s where we come in. Term life insurance is one of most affordable ways you can protect your loved ones’ financial futures. And with different term lengths to choose from (2, 10, 20) and coverage up to $1 Million, our customers have a variety of choices when it comes selecting policy options. Get a quote right now to see yourself. I’d say freaky fast, but that wouldn’t be fair to Jimmy John’s. But really, our application process is so fast, you could apply on your phone while you’re waiting in line for your latte. Get an instant decision, and if approved, buy your policy right then and there. 100% online — no lengthy paperwork or medical exam needed. No (needle) pricks here! Our brand new underwriting framework was built with the modern consumer in mind. More people are shopping online every year, so why should buying life insurance be any different? And that’s it! For now. We’ll keep sharing updates as we continue our national rollout and announce other exciting things. Stay up-to-date on the latest by following us on social media.